San Francisco's New $2 Billion Transit Center Is Shut Down Over Cracked Beam "Motorists are kindly asked to avoid driving downtown," the Transbay Joint Powers Authority said Tuesday. The agency apologized to bus commuters, saying it was acting out of caution. One month after it opened, the Salesforce Transit Center complex has shut down in downtown San Francisco, as engineers examine a crack in a steel beam. "Motorists are kindly asked to avoid driving downtown," the Transbay Joint Powers Authority said Tuesday, adding that "transit riders are encouraged to allow extra time for their commute." The closure is in effect "until further notice," the San Francisco Municipal Transportation Agency says. The transit hub sits in the newly named "East Cut" neighborhood near the San Francisco-Oakland Bay Bridge. As member station KQED reports, it is "expected to accommodate 100,000 passengers each weekday, and up to 45 million people a year." Apologizing for the delays and detours, TJPA Executive Director Mark Zabaneh said, "The safety of everyone who visits the Salesforce Transit Center is our highest priority and we will work expeditiously to address and rectify this situation." Zabaneh added, "While this appears to be a localized issue and we have no information that suggests it is widespread, it is our duty to confirm this before we allow public access to the facility and continue service." In an update Tuesday night, Zabaneh revealed that the crack was found near a weld on a horizontal beam, according to The Associated Press. "The behavior of the beam is unpredictable," he said. 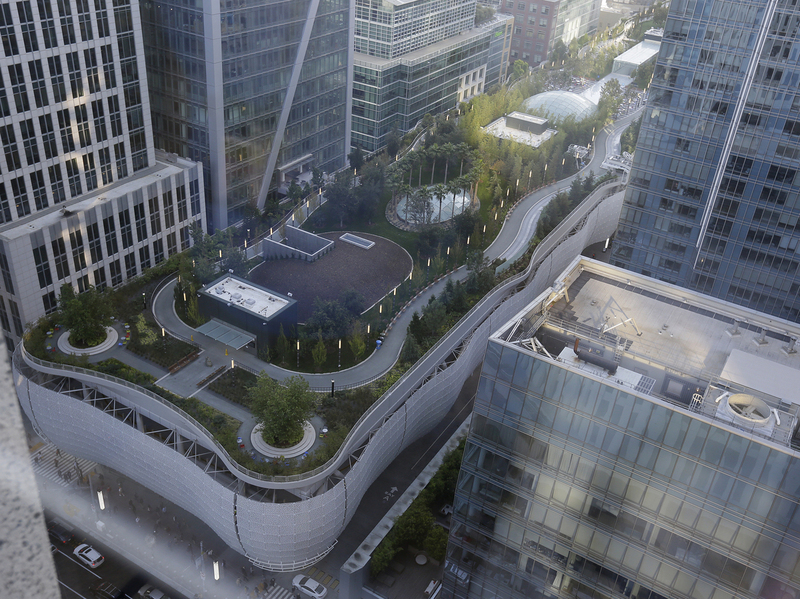 The transit center is meant to be a crown jewel in San Francisco's infrastructure. It has a futuristic design, with a bulbous facade of white metallic lace facing the street, obscuring multiple decks of bus lanes. Its rooftop is landscaped with trees and plants — part of a nearly 5.5-acre park that includes themed gardens, performance spaces and restaurants. The structure sprawls nearly three blocks, with large glass panels bringing sunshine into the building. The transit hub was on the drawing board for decades and took eight years to build. It opened last month to much acclaim — and there are plans to launch an aerial tram that would carry up to 20 people at a time up to the park level. The transit center is next to several high-profile buildings in San Francisco's downtown, including the newly opened 61-story Salesforce Tower, which is connected to the site. The software company bought the naming rights to the transit hub earlier this year, paying $110 million for 25 years, as KQED reported. "The transit center sits adjacent to another dubious landmark, the so-called sinking condominium, Millennium Tower, which has settled about 18 inches since it opened over a former landfill in 2009. Homeowners have filed multiple lawsuits against the developer and the city, some alleging that construction of the transit center caused the Millennium Tower's sinking." Zabaneh said he doesn't think the crack is related to that sinking issue — and John King, the San Francisco Chronicle's urban design critic, agreed. "The transit center's foundation is a 5-foot-deep, 60,000-ton concrete mat," King writes for the Chronicle. "Work on the foundation was completed in 2014, and there has been no evidence since then of ominous settling." Both King and the experts he consulted said that analyzing and fixing the beam problem could take time — but at least one of those experts also noted that it's easier to repair and bolster a steel beam than it is to strengthen a concrete beam. Future plans for the transit center include an 800-foot tunnel to connect it to the city's Bay Area Rapid Transit trains — and the possibility that another tunnel will also connect it to a Caltrain commuter line, more than a mile away, according to KQED.